The world is awash with glamorous urban destinations - but not all cities are made alike when it comes to nourishing a budding tech startup. 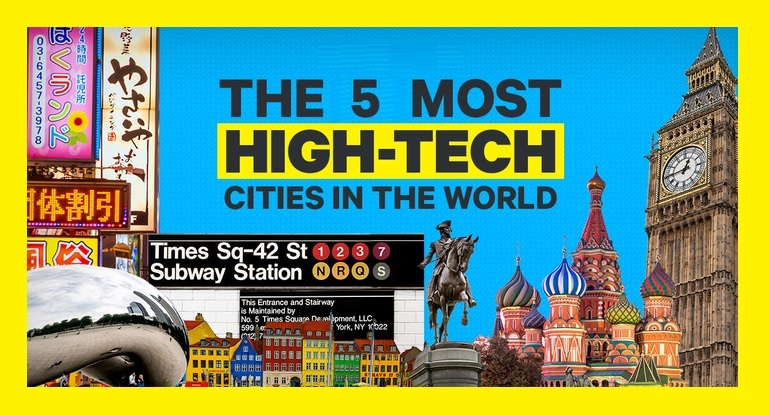 These five cities top our list of the best destinations for technological entrepreneurs to open shop. Not only are they already home to dozens of tech startups, but they also feature plenty of resources to help your small business succeed. If you're ready to quit your day job and get rich, keep on reading to find out where you should go to take your tech startup from zero to hero fast. As one of the tech capitals of the world, Dubai has recently seen a 26% increase in tech startups within its borders. This surge owes much of its success to the booming oil-based economy of the United Arab Emirates (UAE), as well as the top-down model of innovation promoted by the country's totalitarian government. Dubai has much to offer budding tech startups, from decreased regulation to a booming population of potential users. If you're looking to open a tech company in the Middle East, you can get cheap flights to Dubai via Travelstart. All you need to bring is a good idea! Home to tech giants like Facebook and Google, the United States' top startup destination in San Francisco, California has become so famous it even has a popular TV show named after it. More and more MBA graduates in the United States are choosing to seek jobs in the Silicon Valley sector - and the American tech industry's culture of youth and creativity is partially to blame. One word of caution? If you're a woman looking to break into tech, you might think twice about subjecting yourself to Silicon Valley's infamous "bro culture." Still, Silicon Valley offers a unique opportunity for feminists to pave a pathway to equality in the American tech industry - a conversation that is surprisingly necessary, even in the 21st century. American investors were shocked when Toronto, Canada topped any United States city for the number of tech jobs created in 2017. Despite the millions of tech workers in the U.S. (compared to mere hundreds of thousands in Canada), Toronto created nearly 29,000 new jobs in the tech industry last year, surpassing Silicon Valley by a landslide. Canadian cities like Toronto are leading technological developments in artificial intelligence, healthcare and more, yet the city's startup fever has only begun to grip global investors as of late. More and more skilled foreign workers are immigrating to Toronto to begin a career in the tech sector - and you, too, could be among their success stories if you choose Toronto to open your tech startup! China's newest research park at Nanjing poses a threat at the heart of the trade war between America's Donald Trump and China's Xi Jinping. Nanjing is home to the next generation of tech startups challenging Silicon Valley - and China's venture capital is even predicted to surpass that of the United States as soon as this year. Unlike the United States', China's success can be attributed in large part to active government intervention in favor of Chinese tech companies. As a result of these large domestic marketplaces and local innovations, Nanjing's so-called "unicorn" tech companies are estimated to be valued at 2 billion USD. Undoubtedly, this financial success makes Nanjing one of the most reputable startup hubs to emerge from China in recent years. Located in the heart of Israel, Tel Aviv is one of the ones to watch when it comes to burgeoning technological developments. More and more deals involving foreign investors have been attracted to Tel Aviv in 2017 and 2018, making it one of the most influential global capitals for tech startups around the world. In the Middle East and beyond, Tel Aviv has a reputation for being a young city with a less-than-corporate culture - which might be one of the reasons why so many tech startups are drawn to its borders. It also has a history of tech developments dating back to the dot-com boom in the 1990s, meaning Tel Aviv boasts many successful models for the budding entrepreneur to look to for inspiration.